Hi again! Everyone doing ok? My health was improving and then yesterday I woke up with a sore throat and by the middle of the day I had very little voice left...will this cold ever just go away??? My Facebook Live I had scheduled for yesterday was postponed until today at 4pm MST so if you want to see how I did this card you still have a chance to check it out here! 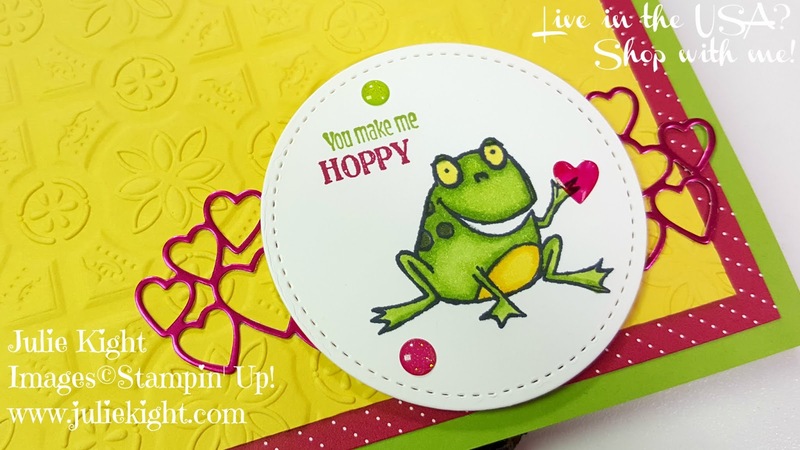 I used 2 different stamp sets to make this card...Meant to Be and So Hoppy Together. 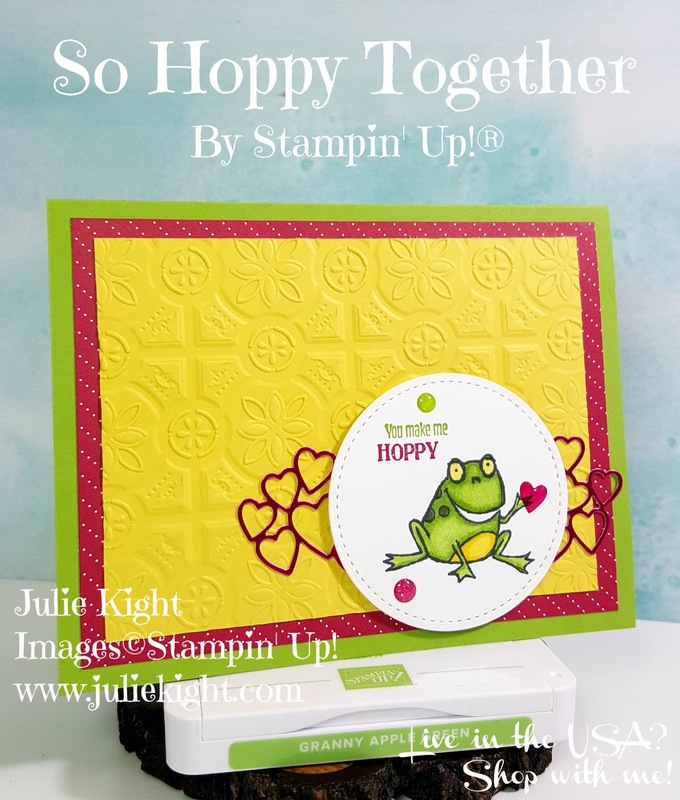 The So Hoppy Together is a Sale-A-Bration stamp that you could get for free with a qualifying order! I also use my Stamparatus to combine two different sentiment stamps into one. The Stamparatus makes it very easy to do this along with some scrap washi tape. I will show in my live how I do this. I colored one of the Epoxy Hearts with the Lovely Lipstick Dark Stampin' Blend. You can color any of the Basic Rhinestones, Pearls, and Faceted Gems with the Blends to make them any color you want to match whatever you are making! I also used the Stampin' Blends to color the cute little frog. 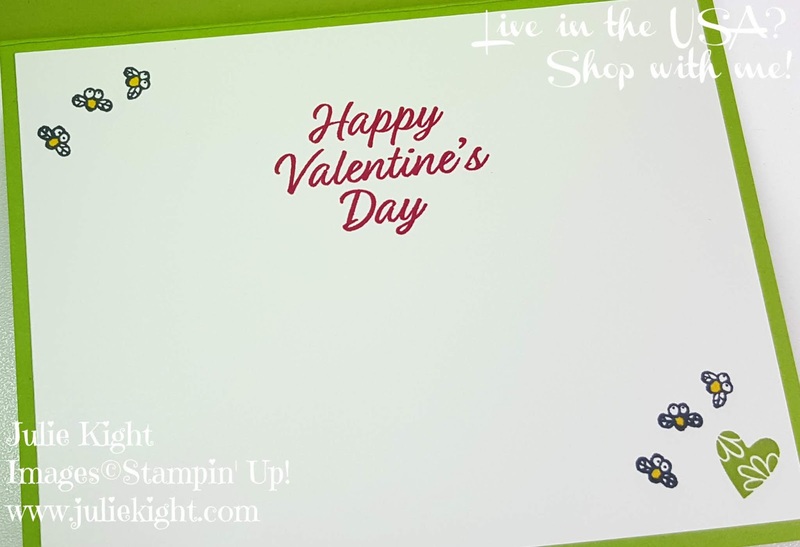 I used the Tin Tile embossing folder to give the background some texture and then I also used a piece of the All My Love DSP (Designer Series Paper) for some pattern and added color. The hearts die cut was cut using the Lovely Lipstick Foil paper. 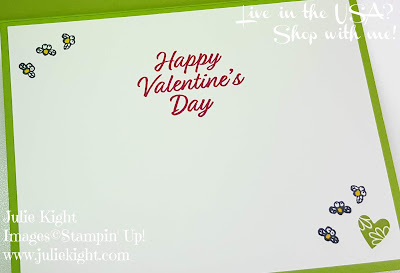 I stamped the inside as well and added some cute little Fire Flies and a heart. I hope you enjoyed my card today and I hope to see you at my Facebook live later today. If not I will be posting the video tomorrow here on my blog. Thanks for looking and if you have any questions about what I used then contact me here. February Paper Pumpkin - Sneak Peak!